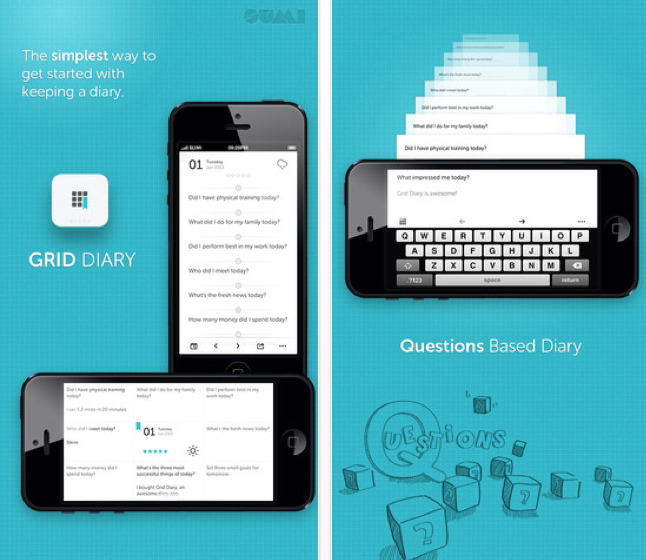 Today’s App Review is Grid Diary by Xiamen Sumi Network. Many of us have great intentions to keep a diary but few of us succeed or at least succeed in keeping the process up. Grid Diary makes this process so much easier. The App asks you questions each day which guide you along instead of your repeating yourself daily just for the sake of saying something. The questions vary from – “Did I spend enough time with my family today?” to ‘What were the three most successful things I ddi today?” and you can pick and choose which ones to answer. There are also categories such as health and news which contain questions relevant to that category. Once you type in your questions they then display on a grid so all you have to do is flick the screen to switch from day to day and find your past entries. You can also search a calendar for a specific date. You can also add the weather forecast for the day as well as rating how you felt that day which can be anything from awesome to bad. There is no social media integration but you can email your entries and you can also send them to iCloud. So if you have always wanted to keep a diary but never succeeded in the past you could give this a try it is certainly a lot more fun than the average blank piece of paper or word processing document.